There are times when you may need to access a Comcast wireless gateway’s administration site to modify, verify or make other changes that are necessary. A Comcast wireless gateway is simply a modem and router combined into one unit that provides Internet access. These are usually given as upgrades from the older modem and router set-ups provided by Comcast These newer units are able to handle the faster Internet speeds that Comcast provides. 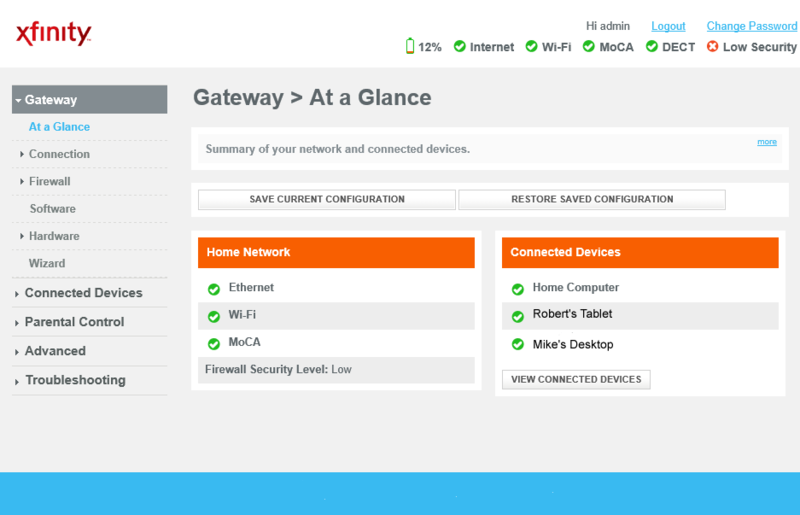 The guide below will show you step by step how to access and log into the Comcast wireless gateway administration site. Open a web browser and type “http://10.0.0.1” (without quotations) in the main address bar. This will take you to the wireless gateway’s administration site as shown below. Once you enter the login information click the “LOGIN” button. Note: If you changed your Admin Tool password previously, you will need to use your new login information. If you don’t remember your Admin Tool password, you will need to factory reset your wireless gateway. You can do this by removing the power supply plug on the back of the wireless gateway and insert a paper clip into the reset hole on the back and hold it there for 1 minute and 15 seconds then release and plug power back into wireless gateway. Allow the unit a few minutes to recover from the reset and re-attempt logging in with the default login settings once again. From this main screen you have many options to choose from. Please make sure you don’t make any changes or alterations that you are not sure about since an incorrect change or modification can cause serious issues with your home network.